Panoramas are all the rage but nothing gives you a better perspective on an area than a broad view. Before sunrise all is calm.....other than the dozens of photographers next to me. Panorama taken off Gorge Rd of Mnt Tom and the entire Wheeler Crest from the Sherwin Grade. White Mountain Peak is the second highest mountain in California. Looking to the west to the Sierra Nevadas across the Bishop tablelands. The view is to the south with the Sierra Nevada to the right and overlooking Mono Lake with Negit and Paoha islands. 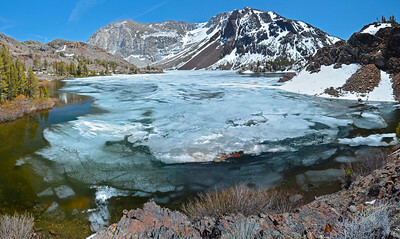 Long Lake, Little Lakes Valley, Rock Creek, Eastern Sierra. Morning on a very clear day at Convict Lake looking at Mnt Morrison on the left and Laurel Mnt on the right. Sky Rock on the Bishop tablelands. Granite Mountains off Hwy 120, Mono Co. Looking towards the La Sal mountains outside Moab, UT in Canyonlands. Glacier Park Two Medicine Lake vista.